“Marvel Comics yearly reach an incredible 77% of all kids in the United States between 6 and 17.” I have to believe there’s some padding going on, but still, that’s a big number, and I don’t doubt it. Bringing a comic book to school would buy you a class full of friends for a day. I totally remember that for local businesses of the era (typically a Toys R’ Us or a Carvel Ice Cream grand opening), having a costumed Spider-Man on hand meant a big draw for kids. 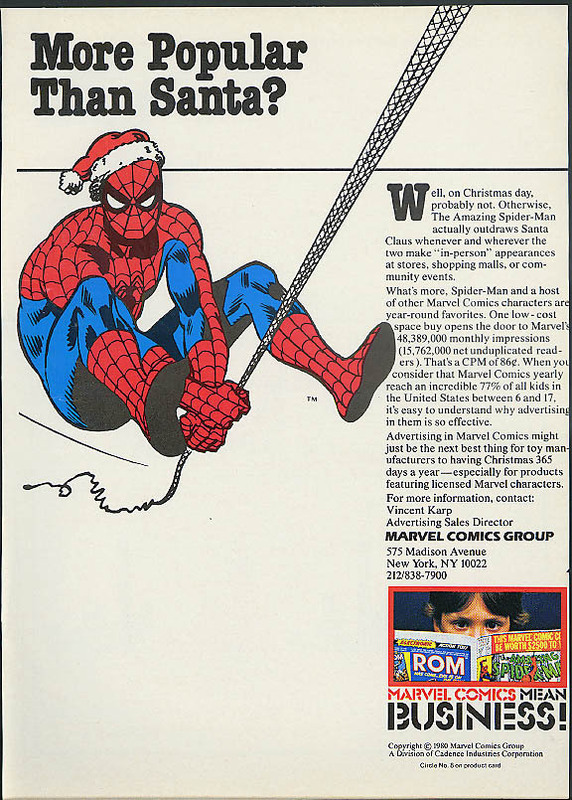 Any old dump could have a clown or a Santa, but Spider-Man?! Plus, we were used to seeing him mute on “The Electric Company,” so he didn’t have to speak and betray his disappointing mundaneness. I don’t remember any appearances in my neck of the woods at the time, although they must have been going on. Maybe my parents thought it was too creepy? I don’t think they took me to see Santa either.